L-theanine supplement is a powerful non-dietary amino acid with great mood-lifting and calming effects. People often consider L-Theanine as one of the best active amino acids for promoting a calm, relaxed, and focus state of mind. For more information about other active amino acids, take a read through here. In this article, we’ll explore the question of L-Theanine supplement comparisons. People often want to compare the effects of common amino acid supplements, and in this article, we answer the top questions comparing L-Theanine to other amino acids. If you’re considering L-Theanine vs any other supplement, this is a great start. L-Tryptophan and L-Theanine are two of the best active amino acids for promoting good health. People tend to associate L-Tryptophan more with a mood-lift and L-Theanine more with calming effects. The reason for this is that your brain converts L-Tryptophan into 5-HTP and serotonin in your brain, causing a noticeable increase in your mood. When people consider the argument of L-Tryptophan vs L-Theanine, they often note that these two amino acids both have their own unique benefits. If you are looking for a subtle but noticeable mood-lift, L-Tryptophan is probably better. L-Theanine supplement would be better as a calming, relaxing amino acid substance with focusing effects. L-Tyrosine vs L-Theanine is a great question! These two remarkable dietary supplements have contrasting effects, so it’s hard for them to compete. On the one hand, the L-Theanine supplement is a calming, relaxing non-dietary amino acid. On the other hand, L-Tyrosine is a stimulatory amino acid – it produces an increase in energy, alertness, and wakefulness. It’s interesting that two very similar molecules can have such differing effects. However, one thing to keep in mind is that this could potentially be a really good supplement stack. Taking L-Theanine with L-Tyrosine gives you the best benefits of both substances. You’ll get the increased energy and wakefulness of L-Tyrosine combined with the calming, relaxing effects of L-Theanine. L-Glutamine is an important amino acid, especially for supporting a healthy immune system and helping with building strong muscles. L-Glutamine has great effects on your muscles, your overall health, and your immune system, but it does not seem to have much of an effect on your mood or cognition. This is why the competition of L-Glutamine vs L-Theanine is pretty one-sided. If you’re looking for an active amino acid with effects on your mood, the L-Theanine supplement is definitely the winner. However, L-Glutamine is a great dietary supplement for supporting a healthy immune system and strong muscles. It is best taken in a protein supplement stack. 5-HTP is a wonderful supplement for boosting your mood! 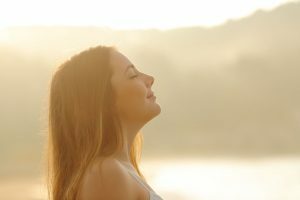 Your body converts 5-HTP immediately into serotonin in your brain – serotonin is known as the ‘happy’ neurotransmitter, directly improving your mood. Read about the benefits of 5-HTP in our recent article. When you consider 5-HTP vs L-Theanine, you need to think about the effects that you’d like to experience. If you’re looking for a powerful mood-boost and energy increase, 5-HTP is definitely the best option. However, if you’d prefer more of a subtle yet effective relaxing effect, rather go for an L-Theanine supplement. These two supplements would also make a good stack when used together. GABA is your body’s primary depressant neurotransmitter, responsible for calming the sensations from your Central Nervous System. 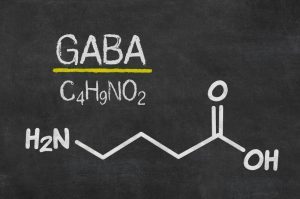 GABA is an extremely important hormone, neurotransmitter, and amino acid. In fact, it is so important that many modern antidepressant and anti-anxiety medications target GABA receptors in your brain. The only problem with GABA as a supplement is that it struggles to cross the blood-brain barrier to deliver effective benefits. When you consider L-Theanine vs GABA, the thing to remember is that L-Theanine is much more effective at crossing the blood-brain barrier and delivering its effects than GABA is. Actually, an L-Theanine supplement has similar effects to GABA – it is calming and relaxing and may help to improve focus and mood. We’d recommend L-Theanine over GABA. In conclusion, L-Theanine vs other amino acids is a great question to ask. A number of top dietary supplements are comprised of active amino acids. The L-Theanine supplement is an effective amino acid for promoting a calm, relaxed state, improving focus and mood, and promoting overall health. It goes well with other supplements that help with calming and focus. The best supplements to compare are L-Tryptophan vs L-Theanine and L-Tyrosine vs L-Theanine. You can definitely use these together as a powerful amino acid stack! L-Theanine also goes really well with caffeine! Influence of Tryptophan and Serotonin on Mood and Cognition with a Possible Role of the Gut-Brain Axis, TA Jenkins et al., Nutrients. 2016 Jan; 8(1): 56, Published online 2016 Jan 20. L-theanine, a natural constituent in tea, and its effect on mental state, AC Nobre et al., Asia Pac J Clin Nutr. 2008;17 Suppl 1:167-8. 5-Hydroxytryptophan: a clinically-effective serotonin precursor, TC Birdsall, Altern Med Rev. 1998 Aug;3(4):271-80.